You have always been so supportive. 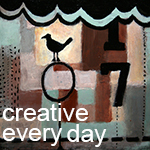 I aim to be creative every day – especially this year. Thanks for everything you do. i think this may be better fit for me that AEDM. I am more of a creative soul than artistic, even though I do paint and sculpt. But i welcome and desire the challenge of creating everyday.